There is little information about the nutritional value of coproducts from the rice industry despite the fact that in terms of total global production, rice is No. 2 among all cereal grains. Cereal coproducts are often included in diets for pigs to reduce diet costs. The nutritional value of wheat and corn coproducts for pigs has been reported whereas coproducts from other cereal grains are less well described. As an example, there is very little information about the nutritional value of coproducts from the rice industry despite the fact that in terms of total global production, rice is No. 2 among all cereal grains. In the United States, annual production is approximately 11 million metric tons and the United States is the fifth largest exporter of rice in the world. Rice is also the main source of carbohydrates for more than 2 billion people in developing countries. However, before the paddy rice is turned into polished white rice for human consumption, it is processed to remove hulls, bran and broken kernels. Rice hulls have very limited nutritional value but broken kernels are sold as broken rice and the bran may be marketed as full fat rice bran or defatted rice bran. In addition, mixtures of rice bran and rice hulls are available as rice mill feed. Brown rice, which contains the endosperm and the bran of the rice kernel, may also be used as an ingredient in diets for pigs. Variation in the chemical composition of rice coproducts affects the nutritional value of these ingredients for pigs (Table 1). Thus, broken rice has a high concentration of starch and is highly digestible, but has a low concentration of crude protein and amino acids. In contrast, FFRB, DFRB and rice mill feed contain 14.5, 16.5 and 6.8% crude protein, respectively, but 25.9, 24.6 and 49.3% of insoluble fiber. The high concentration of fiber in FFRB and DFRB affect the digestibility of energy and nutrients as well as the concentration of energy (Table 2). 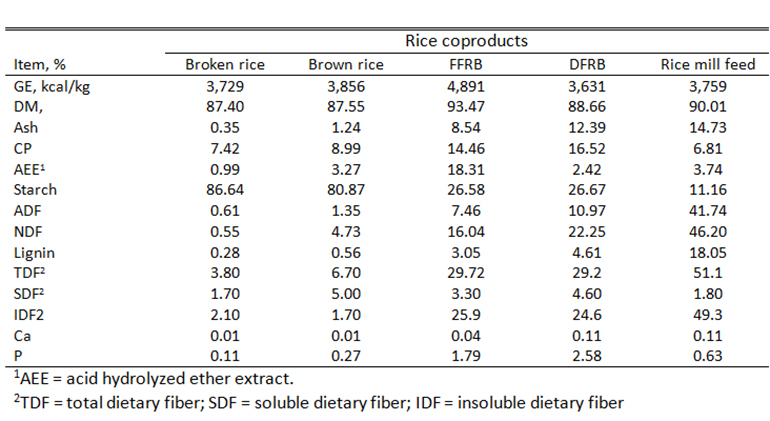 Among the rice coproducts, broken rice has the greatest digestibility of nutrients and concentration of metabolizable energy, followed by brown rice, FFRB and DFRB. Full fat rice bran and DFRB contain 1.79 and 2.58% P, respectively; whereas broken rice contains only 0.52%. However, because most of the P is bound to phytate, addition to phytase is necessary to increase the digestibility of P when these ingredients are included in the diets for pigs. Broken rice is an ingredient that is mostly used in diets for newly weaned pigs to reduce enteric disease and to increase the feed intake. However, inclusion of FFRB or DFRB at 10 or 20% in diets for nursery pigs may decrease average daily feed intake but improve G:F without affecting daily gain. In addition, FFRB may have a prebiotic effect, likely because of the fiber or functional compounds that are present in the lipid fraction, however, more research needs to be conducted on this topic. In growing and finishing pigs inclusion of up to 30% FFRB decreased ADFI and increased G:F without affecting average daily gain. In contrast, inclusion of DFRB increased ADFI and decreased G:F, which is likely a consequence of the lower concentration of metabolizable energy in DFRB compared with FFRB. The concentration of fat in FFRB is between18 and 22%, whereas DFRB contains only 2 to 3% fat. The concentration of oleic and linoleic acid in the fat in FFRB is 40% and 33%, respectively, but inclusion of up to 30% FFRB in diets for growing-finishing pigs did not affect carcass characteristics with the exception that marbling of the meat increased. However, belly fat also became softer and the iodine value increased as FFRB was included in the diets, which is likely because of the increased concentration oleic acid and linoleic acid in the FFRB. In contrast, addition of DFRB to diets for growing-finishing pigs decreased marbling of the meat and did not affect quality or composition of the bellies. In conclusion, rice coproducts may be used as important sources of energy for pigs and these ingredients may replace other cereal in different phases of production without negatively affecting growth performance or carcass quality.